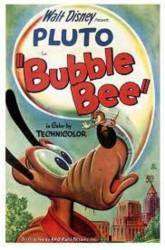 Continuity mistake: When the bee lands on Pluto's nose with bubble gum stuck on it, Pluto's ears are down but in the next shot they are pointing up. Continuity mistake: When the bee kicks Pluto from behind, you can see that Pluto's tail is underneath him but in the next shot his tail is right behind him. Continuity mistake: When the bee sees one of Pluto's footprints, his tail goes into radar mode. At this point you can see that the bee has wings, but in the next shot they have disappeared. Continuity mistake: When the bee sees that his home has been destroyed, you can see that he is standing next to nothing but in the next shot he is standing next to one of Pluto's footprints. Continuity mistake: When Pluto sees the bees' nest, the position of the nest's entrance changes from the bottom to the middle between shots. Continuity mistake: When Pluto turns around and sees the bubble gum machine, you can see that there is nothing behind the machine, but in the next shot a wall has suddenly appeared. Continuity mistake: When Pluto sees the bubble gum machine, you can see that the slide lever is positioned on the left of the machine. In the next shot it is now on the right, and in the shot after that, it is back in its original position.